So, what do you think — should golf courses be converted to shooting ranges? Is golf truly a “good [shoot] spoiled”? This photo was shared by our shooting buddy Jim de Kort from Holland. Click the LIKE button to get regular updates. “Actually golf and shooting are similar sports. Trying to shoot a small object into a small hole from long range.” — Eric A. “You can hit a golf ball 300 yards, but I can hit a golf ball AT 1000 yards.” — Zach S.
“The game should be changed. You should hit the ball out as far as possible, then get your rifle out and hit the golf ball. 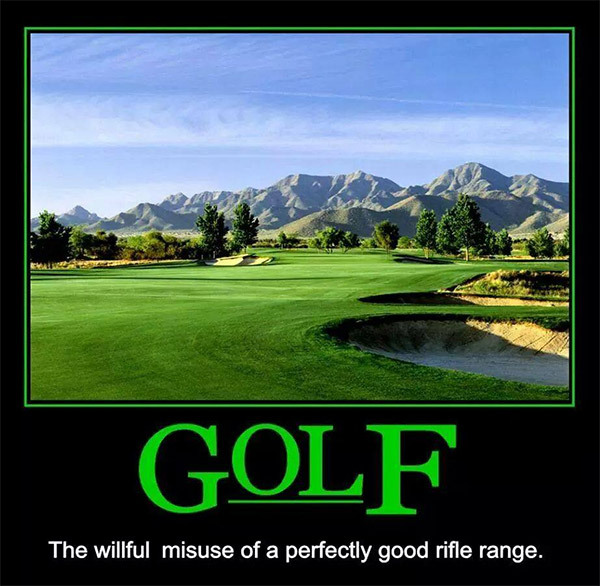 The most golf balls hits… with the rifle wins!” — Hui H.
Share the post "Most Popular AccurateShooter Facebook Post Ever"
“How do silencers work?” We hear that question often. Now, thanks to Silencerco.com, we can answer that question. Here’s a helpful infographic that illustrates the features of a suppressor (aka “silencer”, “can”, or “sound moderator”). Silencers reduce gunshot noise by providing a contained space where hot gases can dissipate and cool before exiting. Silencers are typically divided into multiple, internal expansion chambers. A quality suppressor can reduce gunshot noise by 30 decibels (db) or more. See the chart for comparative firearm noise levels (suppressed vs. un-suppressed). In the United States, suppressors have become much more popular in recent years. In fact, the number of licensed silencers has doubled since 2011. Over 571,750 suppressors are now lawfully registered in the USA. Firearm sound moderators can now be purchased legally in 39 states, provided one obtains the requisite Federal tax stamp. (Texas is the leading suppressor state.) Seven European countries also allow suppressor ownership. CLICK IMAGE to Load Larger Version. Legal for private ownership in 39 states, suppressors are more popular than ever (though many gun owners are still not aware that silencers can be acquired without much difficulty). 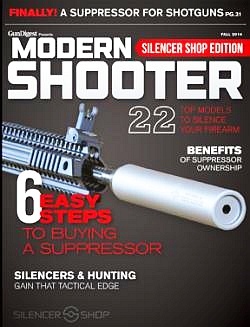 The Fall 2014 issue of Modern Shooter focuses on the popularity of today’s suppressors and sound-moderating technology available for handguns, rifles, and shotguns. This entire issue is dedicated to suppressors and their benefits. This comprehensive guide explains how suppressors work and how gun owners can easily (and lawfully) purchase them. The issue includes a detailed history of the suppressor, which was first patented in 1909 by the son of the inventor of the machine gun. There is also a feature story on hunting with suppressors in Europe. Modern Shooter is available on newsstands and as a digital download at GunDigestStore.com. Share the post "Intro to Suppressors — How Silencers Work"